First you have to know what “portage” means. Think of it as soggy land between two waterways. In our case, we’re talking about the area between the Chicago River and the Des Plaines River. Go back a few hundred years. A traveler would row his canoe up one river, get out and carry it five or so miles across the portage, then plunk the canoe down in the other river and start rowing again. If he was lucky, the portage was flooded. Then he could row that canoe straight through between the two rivers. Irving Park Road follows the general line of a local portage. 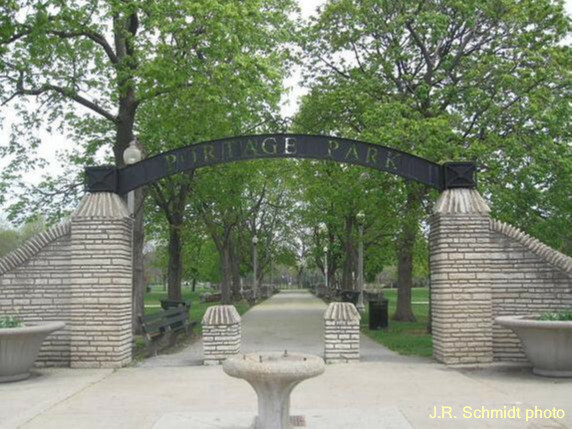 So when a park was planned for Irving Park and Central in 1912, it was called Portage Park. That’s also the name of the neighborhood around it, Community Area 15. Settlement actually began in 1841, when an inn was built along the old trail that became Milwaukee Avenue. Chester Dickinson bought the building a few years later, renamed it Dickinson’s Tavern, and made it into a popular watering hole. In 1850 area residents organized a town called Jefferson. Naturally, they elected their favorite bartender the first supervisor. Many legends grew up about Dickinson’s Tavern. Abraham Lincoln was supposed to have stayed there, and Stephen Douglas, too. One story says that when U.S. surveyors were plotting Milwaukee Avenue, they arranged a bend in the road so that their buddy Chester would have his tavern prominently displayed. The alternate version is that the surveyors got so drunk they put in the bend by mistake. During the 1850s, the Chicago & North Western Railroad tried to build a line through the settlement. The residents weren’t thrilled and one night they tore up the tracks. After that, the railroad changed its route. 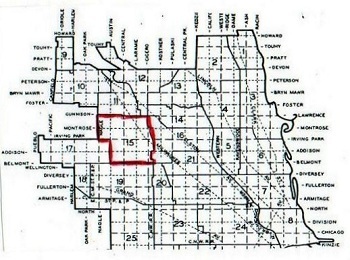 The town of Jefferson became part of Chicago in the great annexation of 1889. A few years later streetcars lines pushed into the area. People followed. The park was opened, and more people came. Developers started building bungalows–hundreds of them. 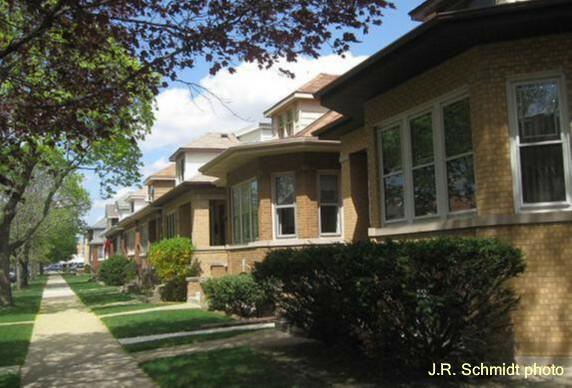 By 1924, the Portage Park community was considered “residentially mature.” The population was about 60,000, described as middle class and skilled blue-collar. Those characteristics have held up ever since. Stores sprang up along the streetcar routes. The major concentration was as the triple intersection of Milwaukee, Irving Park, and Cicero. After Sears opened its store in 1938, Six Corners became one of the city’s leading shopping centers. Dickinson’s Tavern fell victim to progress. In 1929 it was recognized as Chicago’s oldest brick building, but that didn’t save it from the wrecking ball. 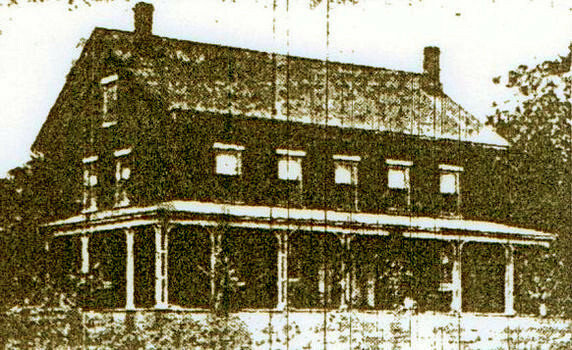 The historic inn was torn down and replaced by a commercial block–which later gave way to a strip mall. What happens when a community reaches residential maturity? It tries to hold its own. That’s what Portage Park has been doing for 80-some years. Drive down most of the side streets, and the bungalows and two-flats look much the same as they did in the 1920s. The business districts have not done as well. When people bought cars and abandoned public transit, there was less need for ribbon commercial strips. 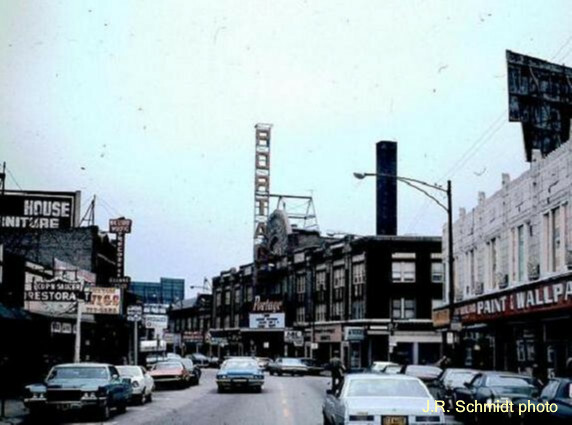 Six Corners remained prosperous into the 1990s. Today along Milwaukee or Irving Park, there are many vacant storefronts. The largest nationality group in Portage Park is people of Polish ancestry. The population remains largely white ethnic. In recent years, the community has attracted a growing number of Hispanics. Portage Park has many local landmarks. The Portage Theatre--the focus of an ongoing preservation battle--still operates near the site of Dickinson’s Tavern. Film fans make pilgrimages to Chris’s Billiards, where scenes from The Color of Money were filmed. Architecture tours often include the Karl Stecher House and the Peoples Gas Store. Luther North High School is built on the site of an old semi-pro ballpark, Rockola Stadium. 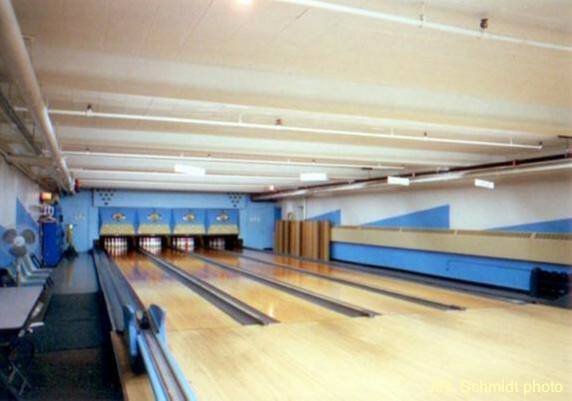 At St. John’s Lutheran Church, you can find Chicago’s last “church bowling alleys.” In the center of it all, the park itself remains, with its tree-lined walks and Olympic swimming pool. And, of course, there are the bungalows.